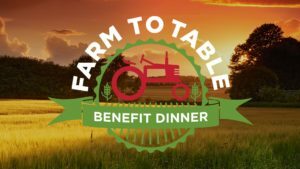 Saturday, October 27, 5:30-9:30 p.m.
Join us for a five-course celebration of locally-grown food and community resilience at The West Monitor Barn in Richmond, VT.
Pay by credit card (fees apply) or call VYCC to pay by check: 802-434-3969 x 112. All proceeds go to the Health Care Share, a farm-to-hospital public health program for eligible patients at The University of Vermont Health Network – Central Vermont Medical Center. The Health Care Share is a collaboration between Vermont Youth Conservation Corps (VYCC) and UVM Health Network – CVMC, with support from Hunger Mountain Co-op. For information about Health Care Share sponsorship levels and benefits, please visit UVMHealth.org/CVMC/FarmtoTable. Our evening will begin with a farm tour, followed by a cocktail hour and a delicious, handcrafted dinner prepared by chef Mike Kennedy, featuring fresh ingredients straight from The Farm at VYCC. Later, we’ll clear the floor and raise the roof with live music from The Microfixers and Friends. Mike Kennedy, Woodridge Nutrition & Food Services Operations Supervisor and graduate of the College of Culinary Arts at Johnson & Wales University, will prepare the evening’s meal. Mike’s cooking highlights local, fresh ingredients in simple, elegant preparations. The Microfixers and Friends is a Burlington-based rhythm and blues band that performs the songbook of vocalist Eva Cassidy. Comprised of a core group of established musicians, most of whom are also UVM Medical Center employees, the band travels and performs primarily in support of charitable causes.